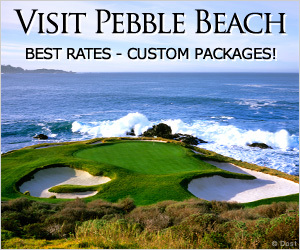 The Monterey Peninsula offers a wide array of lodging accommodations. Choose a location or scroll the entire selection below. America's Best Value Stage Coach Lodge is a 10 minute walk to Fisherman's Wharf & Downtown. Nice rooms with MicroFridge, Coffee, Free Continental breakfast & High Speed Wireless Internet. All attractions nearby. No pets allowed. The Best Western Park Crest Motel offers friendly service, a tranquil garden setting and stunning views of Monterey Bay. The Best Western Monterey Inn features beautiful and spacious rooms with separate dressing area, refrigerators and coffee makers. All are non-smoking. The Blue Lagoon Inn is on of the best values in Monterey. Recently remodeled, free continental breakfast with fresh perked coffee, free High speed internet, microwave, refrigerator and HBO. Close to Del Monte Beach and just minutes to all major attractions. 2362 North Fremont Blvd. Located in the heart of old Monterey near Adobes, Fisherman's Wharf you'll find the Casa Munras Garden hotel along with many other attractions. The Clarion hotel Monterey boasts the area's only indoor heated pool and private sauna - the perfect place for relaxing after a strenuous day shopping or sight-seeing. The Comfort Inn Carmel Hill is located in the heart of the Monterey Peninsula close to the area's attractions and downtown beautiful Monterey. Enjoy the serene flower gardens, as beautiful as the ones you have at home. Heated Pool. 1252 Munras Ave.
Come visit Monterey in sunny California and visit all the exciting attractions while staying at the Comfort Inn Munras Suites. 1262 Munras Ave. Whether you are here to golf, visit the area's attractions, or a romantic get-a-way, the Comfort Inn Monterey Bay has the perfect room for you. 2050 N. Fremont Blvd. Discovery Inn is located just blocks away from Del Monte Beach & Downtown Monterey. Rooms are comfortable and spacious. Free continental breakfast, premium cable TV in each room, easy access to your car. The Downtown Travelodge offers great, personalized service in one of the most beautiful spots on earth. 675 Munras Ave.
After a day of exploring the Monterey Peninsula, return to this friendly hotel and relax. We offer 143 comfortable guestrooms and an outdoor heated pool and Jacuzzi. 1400 Del Monte Blvd. Lone Oak Lodge was voted Monterey Peninsula Travel Planner's Best Value. 2221 N. Fremont Blvd. Marina Dunes Resort includes luxurious, beachfront bungalows that lie scattered across 19 acres of secluded sand dunes, offering a natural experience of exceptional comforts for inspiration along California's Central Coast. 3295 Dunes Dr. The Monterey Bay Lodge is within 5 to 10 minute walk of downtown and Wharf, this beautiful garden hotel has just completed a total remodel/renovation.Heated pool and spa, in-room coffee, HBO, safes, hairdryers, on site restaurant. The Monterey hotel now offers free high speed wireless internet access in the common areas of the hotel. The Monterey Marriott is located in the heart of a historic downtown on Monterey Bay, and surrounded by the attractions of the spectacular Monterey Peninsula, the Monterey Marriott provides an ideal location for your business, recreation and meeting needs. At the Monterey Peninsula Inns, each spacious room offers one or two beds, a comfortable sitting area and features beautiful appointments. 1100 Lighthouse Ave. The Portola hotel & Spa is one of the finest hotels overlooking Monterey Bay and nestled between historic downtown Monterey and Fisherman's Wharf. Boutique-style guest rooms, luxurious day spa and three unique dining and entertainment options. Enjoy the ultimate Monterey experience. The Carmel Mission Inn is Carmel's Largest hotel and conference center, full service property nestled amongst the spectacular floral gardens and rolling green hills of Carmel Valley. Offering in-room dining, Villa Carmel Restaurant, bar, fitness room, business center and massage room. The Colonial Terrace Inn is one of Carmel's original accomodations. Just steps from Carmel Beach, close to shops, restaurants & downtown village. Newly renovated, each room offers its own charm and personality with most having fireplaces and many offering views of the ocean. San Antonio & 13th Ave. The Horizon Inn has tastefully decorated rooms. Some rooms have ocean views, fireplaces, balconies and in room jacuzzi's. Junipero Ave. & 3rd Ave.
With a name to remember and a view you will never forget, The Tickle Pink Inn offers luxurious rooms perched high atop rugged cliffs, overlooking the majestic Pacific Ocean. A selection of rooms featuring wood burning fireplaces, in-room spa tubs and complimentary champagne await your arrival. 155 Highland Dr. Newly renovated, Bide-A-Wee Inn & Cottages is located on the tip of the Monterey Peninsula in a quiet, wooded area just one block away from the Pacific Ocean. Bide-A-Wee offers you a relaxing and peaceful stay. Pets Welcome. Deer Haven Inn is located at the entrance to Asilomar State Park and Beach offering the guests the opportunity to stroll the boardwalks through protected dunes or to catch a romantic sunset at Spanish Bay Beach. 740 Crocker Ave. The Lighthouse Lodge offers 64 units nestled among Monterey pines and adjacent to the picturesque ocean-side Pacific Grove golf course. Heated pool, hot tub and contenental breakfast. 1150 & 1249 Lighthouse Ave. The Sunset Inn features vaulted ceilings, patios or balconies, fireplaces and two person Jacuzzi tubs are some of the features available with many of the guest rooms. With this fully restored 1939 landmark, there are no two rooms quite the same. 133 Asilomar Blvd. Enchantingly picturesque, this elegant Mediterranean-style enclave sets exquisite standards for guest comfort and personal service in all 24 spacious rooms and suites. Located along the first and second fairways of the famed Pebble Beach Golf Links, the lushly landscaped grounds, trellised walkways and sun-drenched patios beckon you to step back in time to a private estate offering the ultimate in modern comforts. 2700 Seventeen Mile Dr. The Inn At Spanish Bay features a sweeping design and natural colors inspired by the picturesque setting, and comfortable, contemporary furnishings in a very relaxed atmosphere. A luxurious resort tucked between Del Monte Forest and the Pacific shore, offering magnificent views of forest, fairways and sea. An enclave for both golf enthusiasts and relaxation seekers, the resort offers genuine hospitality and personalized service. 2700 Seventeen Mile Dr.